It was only a matter of time, really. 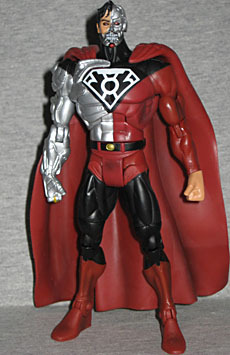 Cyborg Superman was one of the most wanted figures from the end of Mattel's DC Superheroes toyline; Mattel even re-released him in a two-pack for DCU, and he was still difficult to come by at best, making the figure very popular. Then Geoff Johns pulls ol' Hank into the Sinestro Corps and boom - effectively a repaint of an existing popular figure tying it into not one but two huge events in the DCU. So yeah, it was only a matter of time, and only a matter of Mattel that it disappoints. After being destroyed in a radiation accident, Hank Henshaw became a being of pure energy. Henshaw beamed his consciousness into the Kryptonian birthing matrix again to construct a cyborg body out of Superman's DNA and Krytponian alloys, he teamed with the interstellar tyrant Mongul bent on wreaking havoc throughout the universe. This figure is a repaint first and a kitbash second. From the pelvis up it's the same Cyborg Superman we got in DCSH but the legs are from the Superman in DCU6. There's no problem with that, though: DCU is built around re-use, so it's what we'd expect - plus, the different legs aren't only comic-accurate, they help to differentiate this figure from the previous iterations. But indeed there is one newly sculpted piece to the figure and it's the obvious choice: the robotic right hand, which now sports yellow Sinestro Corps rings on each of the four fingers. Oh, wait... did I say "Sinestro Corps?" Whoops, my bad - though they're yellow in color they are clearly Green Lantern rings. I suppose it's not really a big deal, because at that size the color is far more important that the sculpt. 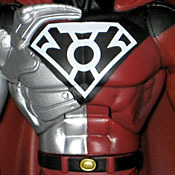 Just like the DC Direct figure, this figure is based on the "Revenge of the Green Lanterns" storyline, and while the DCD figure is based on the cover to Green Lantern #12 (though Hank isn't in the Sinestro Corp uniform on it [hell, he isn't even wearing the modern black/red costume on it but the original blue]) Mattel went with the last page of issue #11. This figure's rings are accurate down to the middle-finger even having a different style. But there's an even more noticeable incongruity to the figure and his Sinestro Corps days... remember how he one has one new sculptural piece? That's a problem because Cyborg Superman, for the entirety of his time in the Sinestro Corps, had four power rings on his human left hand, and typically even had rings on both hands! DCD had the same error, but I can forgive them because their figure came out so much sooner and maybe they weren't clued into the Sinestro Corps angle until the figure was already in production, so they just changed the color of plastic for the right hand and the chest emblem to tie in. Mattel, however.... No excuse other than ignorance. 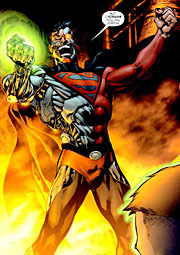 And hell, half the time Cyborg Superman is drawn with rings only on his human hand! Sure, they say it can take over a year for a figure to go from sculpt to shelves, but the Sinestro Corps War, from which this figure comes, was published during 2007, over two years before this figure even left China! The DCD figure was already in our hands when they must have gone into development, so rather than looking at it and thinking "wow, let's one-up them and do this guy totally comic accurate" they just copied everything they did wrong - and then got less right! This may be nitpicky but you can't get more comic-inaccurate for such a specific character/appearance. Especially when so little additional cost was needed to complete him! Even the Green Lantern power ring sculpts fail as an Easter egg because they aren't the right color (and Hank still had the S-shield chest emblem in that storyline). And while I'm complaining, I'll go ahead and point out that in the comics he doesn't have the big wonky mech piece framing the shield logo on his right upper breast. All in all though, it's a well done figure. The paint is all crisp and clear - he even has a Sinestro Corps shield logo on his cape (which also never appears there in the comics). All the articulation works just as well as you'd expect with the head, as always, being the only problem. Though in this case, rather than suffering the "double barbell blues" there's just something weird going on that keeps Hank's head in a "lookin' up to the stars" pose. But, there is good news: this is, at the very, very least, a figure to bolster the ranks of our DCU Sinestro Corps and he is welcome for that alone. He does come with the BAF Kilowog figure's pelvis and head - so if you want Kilowog then you have to get this figure; and odds are, if you want Kilowog, then you want all the Sinestro Corps members you can get your hands on, even if it's as inaccurate as possible without being undesirable. This is ultimately a good figure... until you look at any visual reference of him.